German/Indian filmmaker Harun Farocki (German, b. 1944) has been making dramatic and non-fiction films since the late 1960s. His work is strongly socio-political in content, reflecting his interest in Marxism, and in specific topics such as military technology, industry, prisons, the use of napalm, shopping centers, surveillance, revolution, and concentration camps. He uses and combines disparate source materials including aerial and documentary photographs, film footage, and newsreels, often incorporating texts and/or voice narratives in his works. "Farocki's videos are unembellished to the point of austerity, but in their stripped-down, virtual verit� style, these films become hypnotic." Underscoring the political and ideological function of image-making, Farocki's films often combine newsreel, archival, and industrial/technological footage with text or voice narrative in the form of "film-essays." "One must work with existing images in such a way that they become new. There are many ways to do this. Mine is to look for buried meaning and to clear away the debris lying on top of the pictures. In doing so, I try not to add ideas to the film; I try to think in film so that the ideas come out of filmic articulation." "Eye/Machine addresses the automation of images in the present era of "smart machines," "smart bombs," and person-less cameras. Deriving from military technology, the first automated images were those photographs taken from airplanes to measure the accuracy of missile drops in World War II. Eye/Machine charts a kind of geneaology from this moment to the current ubiquity of mechanized imaging in the technological and commercial sectors. 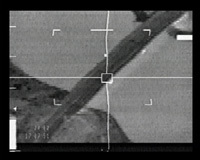 This film's "launching" image is a grainy black-and-white picture of an airstrip seen through an automated viewfinder. Beneath it, a subtitle reads: "Images like these could be seen in 1991 - of the wart against Iraq/Operational images/Not Propaganda, ye an ad for intelligent machines." Source: GreeneNaftali Gallery, NYC. Eye/Machine courtesy GreeneNaftali Gallery. 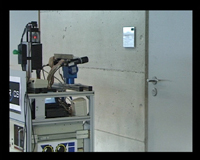 length: 25 min., format: video, col.